A delightful retelling of the classic fable following two friends as they discover that there’s no place like home. 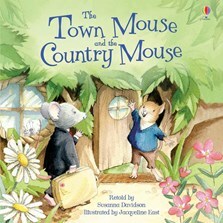 Toby Town Mouse loves to live the high life, while his cousin Pipin prefers a quieter life in the countryside. When the two visit each other’s homes, will they realise that sometimes differences aren’t always a bad thing? Whimsical text and charming illustrations make this book perfect for sharing and reading aloud together.